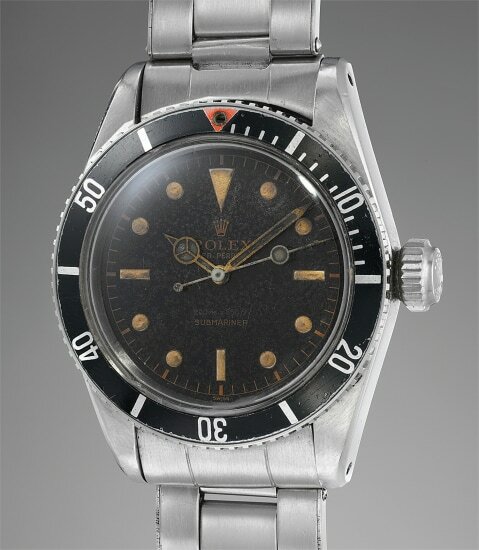 Model Name: Submariner "Big Crown"
Produced for a short period of time only in the late 1950s, reference 5510 notably features a big crown with no crown guards. Some examples were chronometer certified, while others displayed "Submariner" along with the depth rating - these variants are known as "Two Liners". In production for a few years only, reference 5510 is instantly recognizable and characterized by its black lacquer ‘Swiss’ dial, lack of crown guards and 8 millimeter Brevet ‘big’ crown. Research suggests that reference 5510 was made in an exceedingly small series of less than 300 examples. The Big Crown Submariner has a special place in the hearts of Rolex collectors, having been immortalized in multiple James Bond films. Bond’s gadget is famously disguised as a ‘Big Crown’ Submariner, which is equipped with different spying abilities. This particular example features crisp, sharp bevels which are incredibly wide in their proportions. Furthermore, it still retains its original crown. The luminous material on the hands and numerals have aged with warm patina. As an added feature, this watch is fitted with an original Rolex "Big Logo" bracelet that is incredibly collectible today. It is stamped for the fourth quarter of 1959.